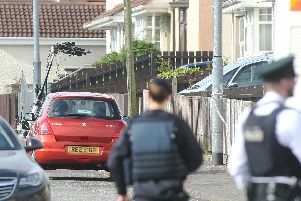 A PSNI recruitment event that had been scheduled to take place in the Waterfoot Hotel in Londonderry on Saturday (October 17) will not go ahead – but that does not mean the paramilitaries have won, said a unionist MLA. Mr O’Doherty said he was putting the safety of his staff and customers first by cancelling the event. Gary Middleton, DUP MLA for Foyle, said: “Certainly he [Mr O’Doherty] can’t be condemned for that. However, I am disappointed it has had to be cancelled. “We have to look at the reasons ... Garvan had to weigh up his support for the PSNI – he has committed to that – but also bear in mind the fact he’s also concerned about his own staff and how they’re feeling vulnerable. “I don’t believe it is a victory for dissidents. Asked if a facility run by the Sinn Fein-dominated council could be used to host the event, he said it “would ultimately be “up to the PSNI” to choose a venue. The recruitment session had been due to take place at the hotel on Saturday but the PSNI decided to reschedule the event as they feared a protest planned by Republican Network for Unity (RNU) had the potential to interfere with a wedding that was due to take place at the hotel at the same time. A PSNI spokesman confirmed the PSNI recruitment familiarisation event planned for this Saturday will no longer take place at this venue. Assistant Chief Constable Mark Hamilton said: “I am aware of the disruption that was caused by the security operation in Derry last week and would like to thank everyone who co-operated and worked with our officers. I would also like to thank the management and staff at the hotel for their support throughout. “We are currently seeking an alternative venue for this event and remain committed to providing encouragement and information to those who wish to find out more about the opportunities that exist within the Police Service. He said there have already been 2700 applications in this current recruitment process and he encouraged those interested in joining the PSNI and who want to make a positive contribution to Northern Ireland to apply. “We need individuals who understand the benefits of policing with the community and the positive impact it can have on people’s lives,” he said. For further details on how to apply visit www.joinpsni.co.uk. The closing date for applications is Friday 23rd October at 12noon.